I confess to being on pins and needles about my tomatoes. It's been a bit of a rough year in the garden so far, which means plenty of lessons learned. It also means some heartbreak. Some crops didn't pan out and others simply never made it to the pan. Bugs, a little bit of disease, a little bad timing, and weeds that nearly took me down with them have been a few of my teachers this year. The tomatoes - four Brandywines and four Black Zebras - are American heirlooms that I'm growing for the first time in my Tokyo garden. I'd grown Brandwines in Michigan and dearly loved them. 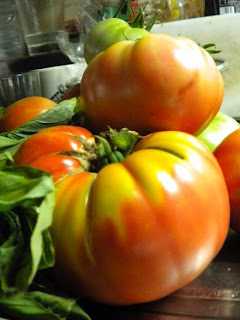 (Frog Holler Organic Farm did turn me on to a couple early ripening heirlooms, but Brandywines remained near and dear.) Growing these tomatoes and anticipating the joy of sharing a taste of home with friends here gives me more pleasure than I can describe. Seeing the plants under stress and attacked by critters literally wakes me up at night. Did I do something wrong? Did I forget to do something? Did I do something too early? Too late? The list goes on, and I toss and turn. Then there are the warnings about birds, urban wildlife, and general concern about attempting to grow American vegetables in a totally different climate. Well, in spite of (or despite) my worrying, the tomatoes just gave up their first fruits. Harvested a little early, these misshapen beauties are all that I could have hoped for and more. Burly fruit that tastes of home and all the best of summer, I can barely wait for tonight's dinner where we'll devour them sliced with a bit of sugar or just plain. A feast for homesick taste buds.